All certificate programs are delivered through CEG's alliance with Duke University Management Training. Together, we deliver quality professional development programs backed by 90 years of academic excellence and 27 years of optimizing business performance. Lean Six Sigma quality-improvement methods focus on reducing defects, streamlining processes, and improving product quality. This program focuses on the advanced skills in the Lean Six Sigma approach. Black Belt Training provides comprehensive development for Lean Six Sigma specialists to build on Green Belt training and develop dedicated resources for improvement projects. Understand Lean Six Sigma advanced skills and tools using the DMAIC process. Learn leadership and team skills. Apply skills in project management, process management, Lean, and statistical analysis to business issues. Understand organizational change process and tools. Close out projects upon completion and to sustain gains. Utilize statistical analysis software to analyze and visualize data. The Lean Six Sigma Black Belt Certification Program consists of nine days of classroom training — three 3-day sessions over the course of 12 weeks. The program is also available in a virtual, Instructor-led format. 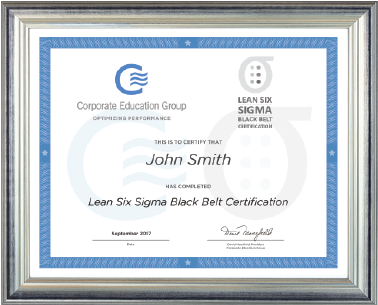 To achieve a CEG Lean Six Sigma Black Belt Certification, each participant must successfully complete the course which includes attending all sessions, completing assignments, passing a final exam and completing a relevant project, for which he or she is the lead, within 12 months of the class end date. If you are interested in taking this program, please let us know and we will add you to our wait list. Or let’s explore setting up a private delivery for your team. Email info@corpedgroup.com or call 1.800.288.7246. You can also earn this certificate through CEG’s alliance with Duke University to build professional credibility with quality training backed by a renowned higher-education institution. Participants who opt for the CEG/Duke University Management Training Lean Six Sigma Black Belt Certification Program are required to pass a 30-question exam at the end of each 3-day session to earn a co-branded certificate of completion jointly issued from CEG and Duke University.